DAY 1 – Welcome to Lombardy! Arrival at Malpensa and transfer by minivan to Laveno, the most important resort on the east bank of Lake Maggiore. Stop for a light lunch on the way to Laveno. This bustling town, surrounded by beautiful mountains, has porticoed buildings and pedestrian areas, ideal for walks by the lakefront and for shopping. Check-in at the hotel, briefing on the use of the e-bikes and dinner at the hotel restaurant. Ride to Villa Porta Bozzolo through the cycle lane. This charming villa is arranged on two levels and dates back to the early 18th century. Back to Laveno. A ferry service provides transportation to Verbania, where the huge botanical garden of Villa Taranto can be visited. It includes approximately 1000 non local plants and 20,000 varieties and species of great botanical value. Thousands of plants coming from all over the world form rare collections. A ferry service will take you to the fascinating and popular tourist destination of Eremo (Hermitage) di Santa Caterina del Sasso, set between the rocks and the water, and almost looking as though it is suspended in mid-air; it represents the very essence as well as the most important religious building in Verbania. Back to the hotel in Laveno. 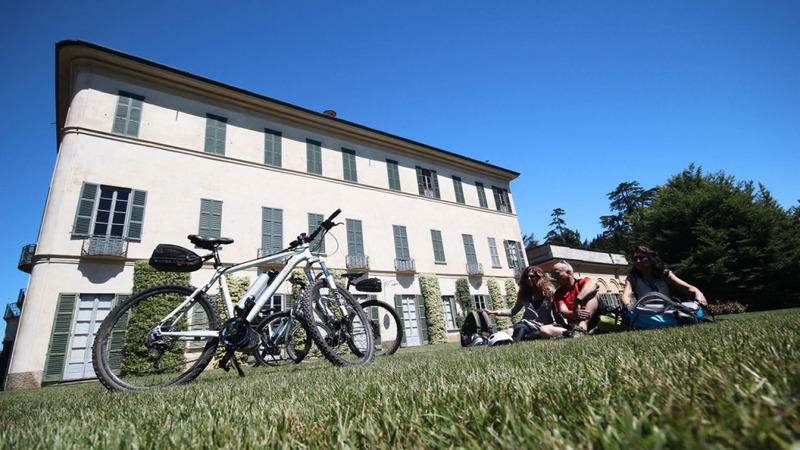 Transfer to Varese and visit by e-bike to Villa Menafoglio Litta Panza di Biumo, which is famous worldwide for its collection of contemporary works of art, that Giuseppe Panza di Biumo collected there from the ‘50s onwards. It is currently owned by Fai. We ride to Sacro Monte di Varese: The architectural style of the chapels, the triumphal arches and the fountains, the statues and the frescoes decorating the chapels, are excellent examples of 17th century religious art in the Milan area. A magnificent panorama unfolds all around: the Varese lakes, Comabbio, Maggiore and the outstanding beauty of the mountains and majestic Monte Rosa. Transfer to Como, on the Como Lake, check-in at the hotel and rest followed by aperitif and dinner. 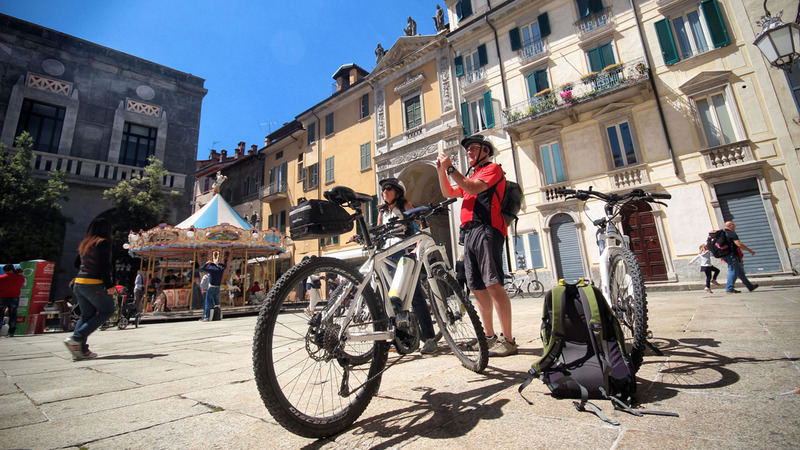 Tour by bike of the city centre of Como, transfer by boat to Lenno. 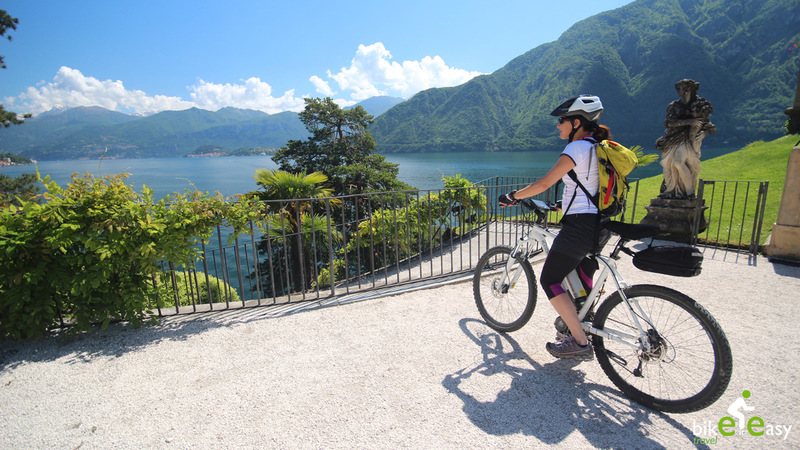 Ride with the e-bikes along the lake to reach Villa Balbianello. Laden with history and romantic allure, the Villa is surrounded by a beautiful garden with a breathtaking view of the lake. We visit then Villa Carlotta, one of the most fascinating and ancient mansions of Lake Como, built in 1690. Transfer by ferry to Bellagio, “the pearl” of Lake Como. Everything there is special and unforgettable. The ancient Borgo (hamlet) is a characteristic feature of Bellagio: narrow cobblestone roads, alleys and striking stairways alternate with postcard-like views. 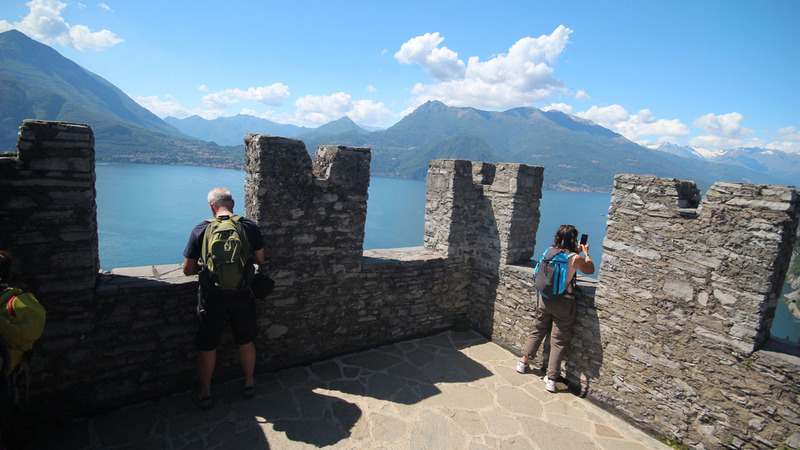 Transfer to Varenna and ride up to Castle of Vezio, whose origins probably date back to a Ligurian-Celtic settlement. Transfer by minivan to Lecco, located on the east branch of the Lake Como, between the mountains of Resegone and Grigna, that has always attracted painters, scholars and cultured people from the time of Leonardo da Vinci. 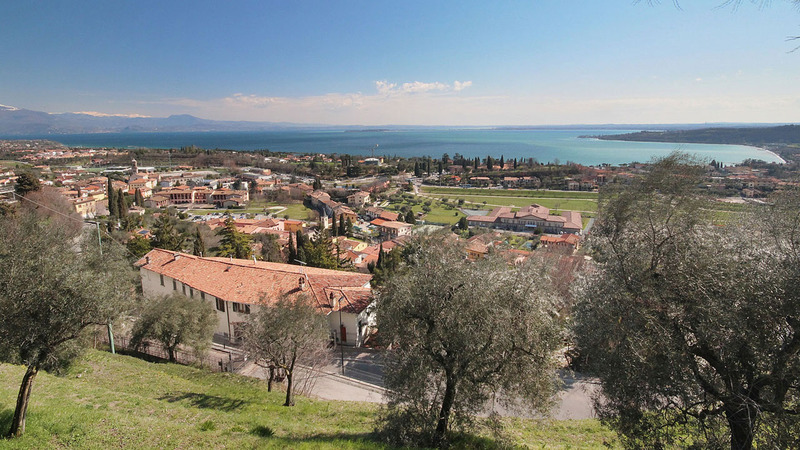 Transfer to Sirmione, on the Lake Garda. 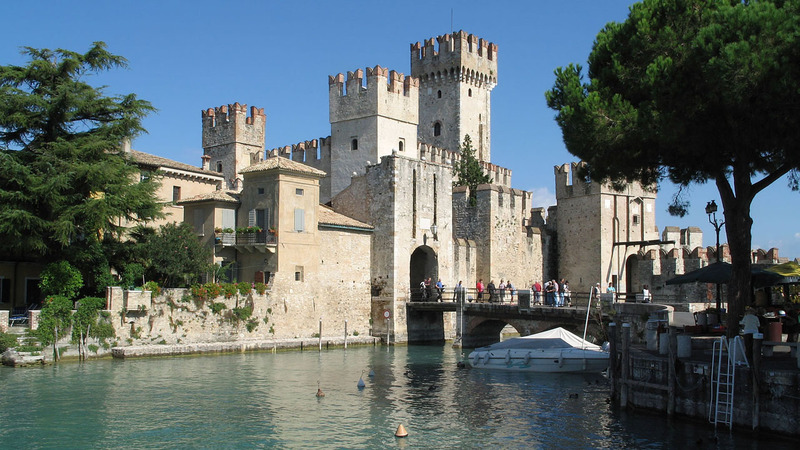 Visit of Sirmione, a beautiful medieval city with a 14th century castle overlooking the lake. We then ride to Desenzano, where we visit the city and have a light lunch. 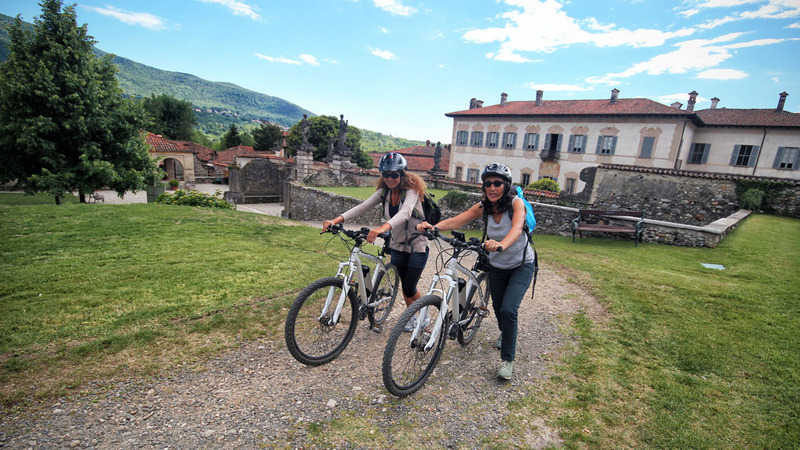 Riding up and down the breathtaking hills overlooking the lake, rich of vineyards and olive trees, we arrive at Maguzzano Abbey, a Renaissance construction, in a very peaceful place. We ride then on the ridge of the hills to the Castle of Padenghe. 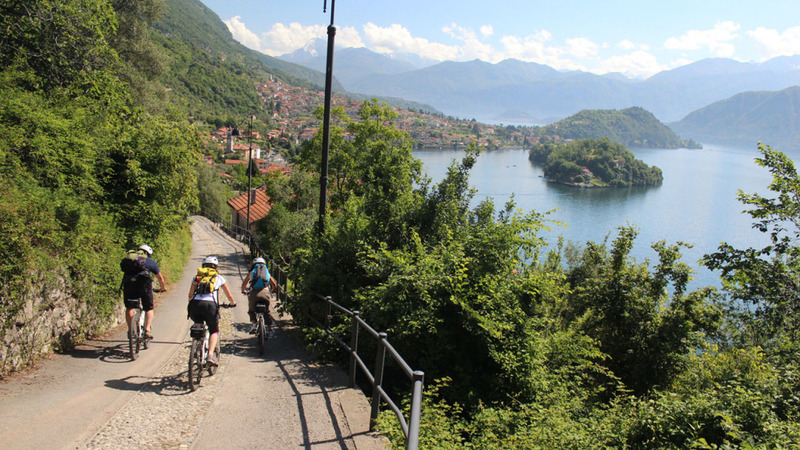 We ride up along the bike lane reaching a high altitude among green hills with a stunning view on the gulf of Salò, historic point of reference along the Lombardy coast of the Lake Garda. Check in at the Hotel in Salò, followed by an excellent dinner. Visit of Salò with a Duomo, a beautiful gothic church, with its marble portal and Renaissance sculptures and paintings. Without the bicycles, we embark on a boat that takes us in 20 minutes to Gardone Riviera, where we lunch in a typical restaurant overlooking the lake after visiting the well-known Vittoriale, the monumental residence of the famous Italian poet Gabriele d’Annunzio. Back to Salò and transfer to Verona.